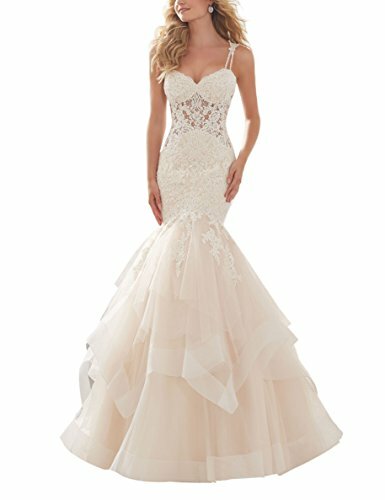 Diamant¨¦ Beaded, Alen?on Lace Appliqu¨¦s Adorn the Bodice of this Glamorous Mermaid Wedding Dress. The Flounced Tulle Skirt is Accented with Horsehair Trim. Appliqu¨¦d Double Shoulder Straps Wedding Dress. We look for vibrant colors, beautiful sheen and rich textures in every material that goes into your dress. Our tailors do all ruching by hand to create the perfect shape and fullness on each dress. We strongly suggest you have your measurements taken by a professional before buying online. And welcome to contact us for help. Diamant¨¦ Beaded, Alen?on Lace Appliqu¨¦s Adorn the Bodice of this Glamorous Mermaid Wedding Dress. The Flounced Tulle Skirt is Accented with Horsehair Trim. Appliqu¨¦d Double Shoulder Straps Princess Wedding Dress Fall 2018. If you have any questions about this product by LoveMyth, contact us by completing and submitting the form below. If you are looking for a specif part number, please include it with your message.